The Cad as Mentor – Tell my story. Part of telling Emmett Wilson’s biography includes a mention of those who mentored him in his early law career. Emmett had two primary mentors in his life; one of them was his older brother, Cephas Love Wilson, Esq. If you want to be the best in your field, you want to have the best teacher possible. For Emmett, that was Cephas: Former state senator, former mayor of Marianna, former judge, bank president, railroad stockholder, and big time lawyer in what was then the First Judicial Circuit of Florida. Cephas took Emmett under his wing; he let Emmett work for his practice and gave Emmett a home in between semesters at law school. Cephas eventually took him on as a junior partner once Emmett graduated. Ceph’s tutelage was the ultimate in experiential learning: Emmett received practical, hands-on legal training from arguably one of the best lawyers in Florida at the time. Cephas made Emmett do a lot of the grunt work in his law practice; more valuable was that he and Emmett would debate upcoming cases. Cephas would poke holes in Emmett’s arguments and recommended strategies, teaching him the lawyer’s art as he learned it. Cephas was good, too. He won cases, he had big and important clients, he had a statewide reputation for being an effective jurist, and he knew all the tricks of his trade (some of them dirty). Cephas shared those tricks with Emmett…but not all of them. Ceph wasn’t stupid. He knew he may need to face his brilliant younger brother in the court room one day (and he would, but more on that in the book). Without a doubt, Cephas modeled a successful professional life, and this made a huge impression on Emmett. Cephas’ personal life, however, was much less successful. Big brother’s boorish behavior. 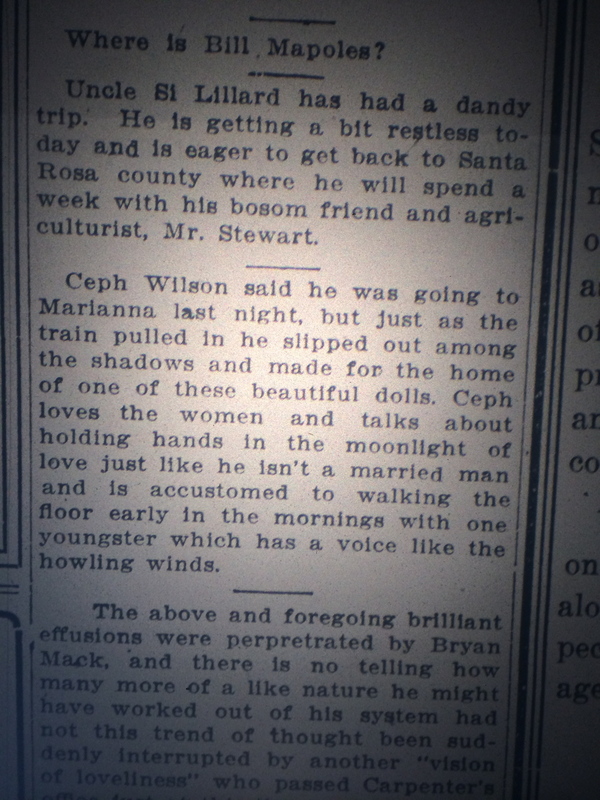 Source: Pensacola Evening News, August 12, 1912. There are several references in the contemporary media that Cephas was not a faithful husband, and in fact, flaunted it, without regard to the feelings of his wife or family. Mentorship carries a huge responsibility. Everything a mentor does, says, and especially, how that mentor behaves, is instruction for the mentee. Poor behavior from a mentor can be perpetuated, especially if the mentee admires and follows the advice of his teacher, and particularly if integrity is not part of the mentor’s modus operandi. In thinking about the people who helped shape Emmett as a young man, I had real concerns about the influence of Cephas. What did Cephas tell Emmett about managing his personal life, for instance? Women threw themselves at Cephas; no doubt they did the same with Emmett. The difference was that Cephas acted on it without regard for his wife, a woman who was well loved in Marianna, who came from a very good and well respected family. I can only imagine what she must have felt when the above article from the Pensacola Evening News appeared. It is evident that Emmett knew what Cephas’ poor personal behavior did to his sister-in-law, and Cephas’ children, too. My inkling is that Emmett was not a cad like his older brother, and in fact, went out of his way to avoid that label, because Cephas’ poor decision making in his personal relationships would and did eventually come back to haunt him. Although his exceptional legal skills were influenced by his older brother, Emmett’s personal life turned out quite differently, because he went out of his way not to act without regard to others when it came to personal relationships. Emmett did have a second mentor who played a critical role in his life; that’s a story for another day (and for the book). A cad as mentor can be a very effective teacher. One need only avoid perpetuating such caddishness. Pingback: The Addicted Life | Tell my story. Pingback: A Second Opinion | Tell my story. Pingback: Life Lessons from Second Bananas | Tell my story. Pingback: Hall of Fame | Tell my story. Pingback: Elizabeth Maxwell Wilson, Part II | Tell my story. Pingback: Tight Circle | Tell my story. Pingback: Buell Cook – Tell my story. Pingback: Dissecting the Message, Part IV – Tell my story. Pingback: In Search of Himself – Tell my story. Pingback: A Galaxy of Stars – Tell my story. Pingback: The Sporting Emmett – Tell my story. Pingback: Wise Wislogels – Tell my story.